All TPCH General Council meetings will be on Thursdays, 3 – 4:30 pm, on the following dates and in the following locations. Nov. 14, 2019 in a location to be announced. Tucson Veterans Serving Veterans (TVSV) is signing up service providers for its Stand Down Veterans Resource Fair for Thurs., March 14, 2019. To participate see and return the attached form to michael.s.dow16.ctr@mail.mil. TVSV asks providers to set up at 8 am, enjoy a free lunch, and stay until 2pm. Auto Einsteins and Unscrewed Theater are giving away a 2007 Kia Spectra to one Southern Arizona female veteran. See and post the attached flyer or email to apply: ww2@womenwarriors2.com. TPCH thanks each individual and organization that volunteered to help make the annual Point In Time (PIT) Homeless Count successful! 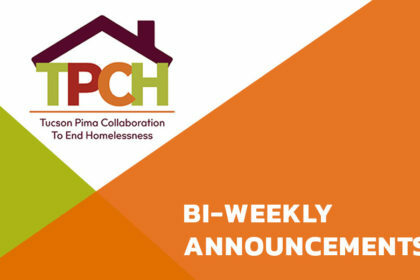 · Visiting shelters that are seasonal or don’t participate in the TPCH Homeless Management Information System (HMIS) on Jan. 22, 2019 to interview guests. 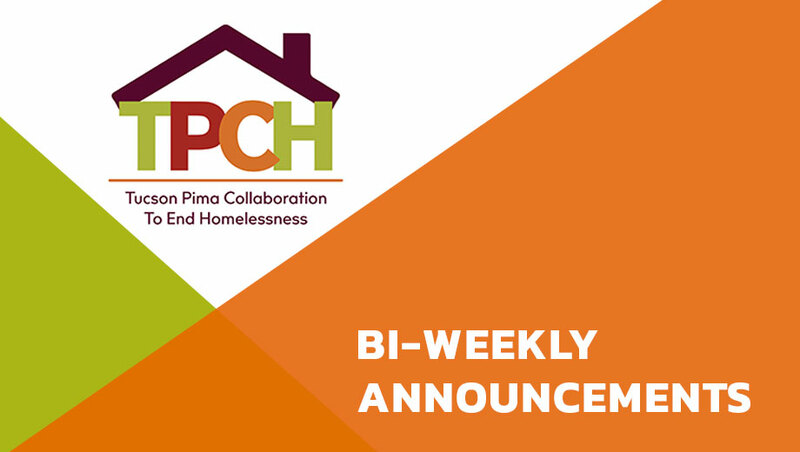 · Spreading throughout Pima County the morning of Jan. 23, 2019 to interview people experiencing homelessness who slept unsheltered the night before. · Inputting data gathered from interviews into HMIS. Equally vital to completing the annual PIT are service providers who gather and accurately record information on their shelter guests and program participants. See the Request for Information (RFI) on the TPCH website home page (scroll down) or in The Daily Territorial next week. Performance Evaluation & Monitoring Committee – Wed., Jan. 30, 9-11 am, Sullivan Jackson Employment Center, 400 E. 26th St. Coordinated Outreach Subcommittee – Thurs., Jan. 31, 9:30-10:30am, American Red Cross, 2916 E. Broadway Blvd. Governance & Planning Committee – Fri., Feb. 1, 8:30-10 am, Sullivan Jackson Employment Center, 400 E. 26th St. Homeless Youth Subcommittee – Fri., Feb. 1, 8:30-10:00am, GAP Ministries, 2861 N. Flowing Wells Rd. Emergency Solutions Subcommittee – Wed., Feb. 6, 10:30am-12:00pm, Library, Trinity Presbyterian Church, 400 E. University Blvd. Coordinated Entry Committee – Thurs., Feb. 7, 1:30-3:00pm, Pettit/Miles Room, Pima County Housing Center, 801 W. Congress St. Governance & Planning Committee – Fri., Feb. 8, 8:30-10 am, Sullivan Jackson Employment Center, 400 E. 26th St.